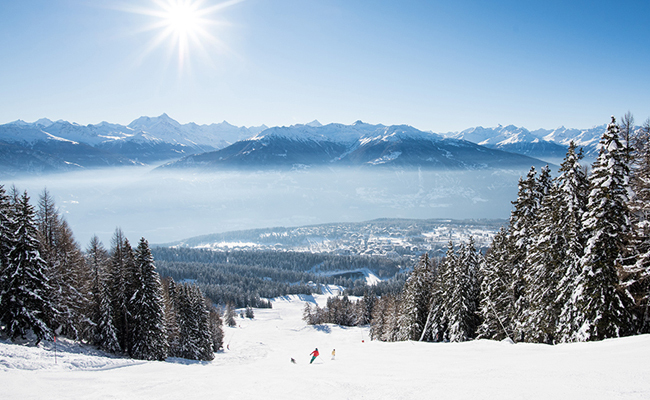 Sun-drenched and spectacularly located, Crans-Montana is among the crème de la crème of Alpine ski resorts. 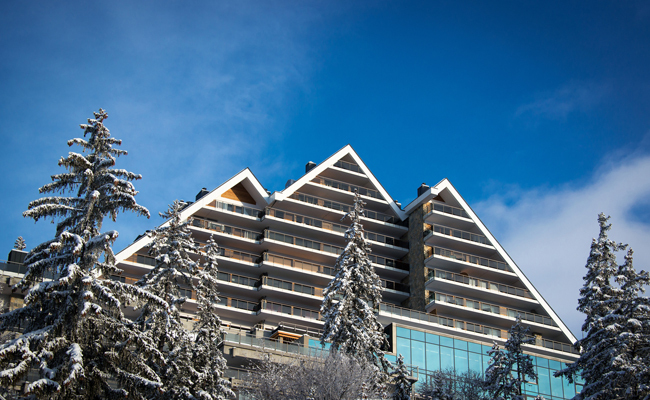 Essentially a twin town – Crans and Montana coming together to become one of Valais’ best-loved holiday destinations – the area has breathtaking views and a gourmet dining scene. It’s also assuredly family-friendly, having won the Swiss Tourism Federation’s ‘Family Destination’ in 2016, 2017 and 2018. There’s also a long golfing tradition going back to 1906, and – since the region was once the haunt of celebrities from all over the world – it’s temptingly exclusive. Now that you’re feeling inspired, read on for a snapshot of this enduringly popular spot. Just a couple of hours from Geneva, the Crans-Montana resort in Switzerland stretches from the Rhône Valley across to the Plaine Morte Glacier. It’s surrounded by lakes, forests and vineyards, and nature lovers can take in panoramic views from Dufourspitze to the Matterhorn, and on to Mont Blanc. 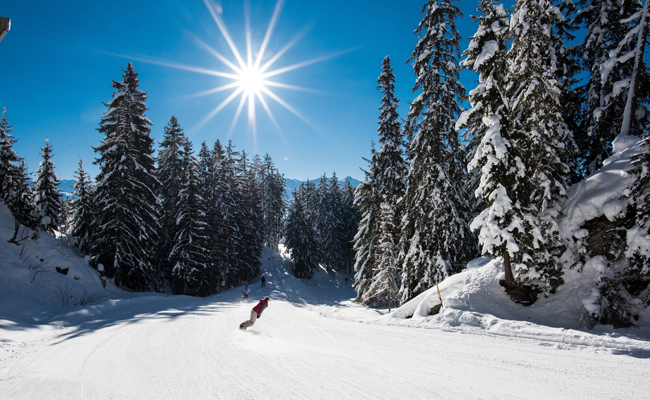 As it’s entirely south facing, the resort enjoys Switzerland’s best sunshine record too, so the weather is almost always on your side for a week on the slopes during winter. Most of the descents in Crans-Montana sit comfortably in the blue and red divisions, so it’s a welcoming spot for beginners and intermediates though there’s plenty to keep adrenaline chasers busy too. There are 140km of runs in total, that reach as high as 3000m on the glacier, and you can access all of these by four fast lifts. Eleven kilometres of dramatic drops, 8 black runs and some great tree runs that require a certain amount of skill should please more experienced skiers. There’s a snow park for snowboarders and some off-piste challenges at La Toula, La Tza and Chetzeron. So much direct sunlight can prove formidable for snow certainty, so it’s best to visit Crans-Montana in the coolest months but the pistes are beautifully groomed all season nonetheless. The towns of Crans and Montana are in a fairy tale Alpine setting, among snow-dusted woods and plenty of old-world character. Yet they both have a distinct personality. Crans is the more upmarket of the two, with incredible opportunities for boutique and designer shopping: think Prada, Hèrmes and Louis Vuitton. 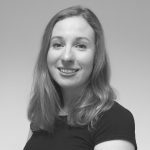 Here you’ll discover top restaurants like Le Mont Blanc and Didier de Courten, as well as five-star hotels, bars where you can dance the night away and a charming cinema. In October, we are offering an exclusive deal at both the Hotel Art de Vivre and our Crans Ambassador hotel, which includes two complimentary nights added to a five-night booking. 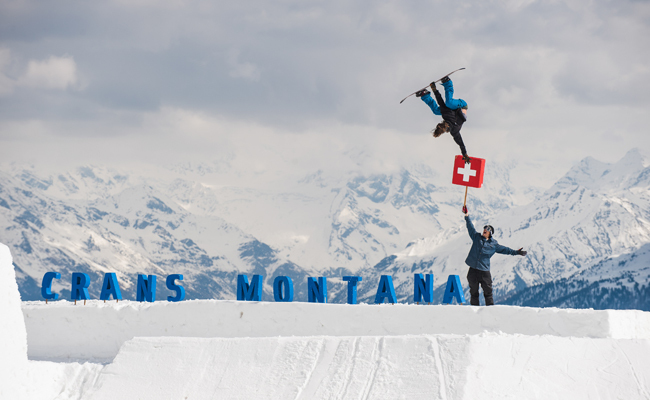 Montana is Crans’ younger neighbour, revelling in a lively entertainment scene and slightly more modest prices. Head there for sweet treats at David, l’Instant Chocolat. 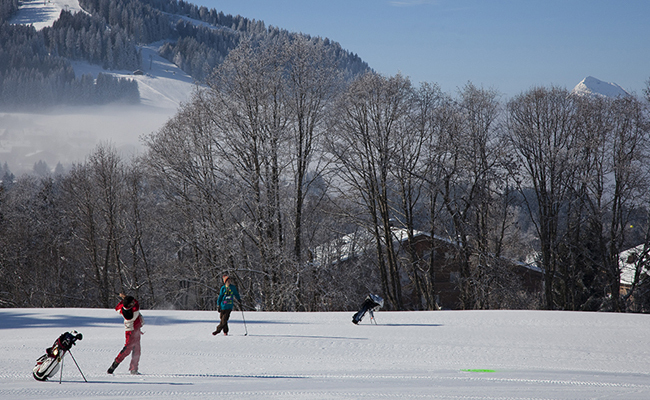 Crans-Montana has so much to do that it’s the epitome of an active break, even for non-skiers. Lifts open before 9am so you can get onto the slopes before the warmest part of the day, and hiking trails zigzag through the snow, offering a heart-pumping alternative to whistling down the runs. Hot chocolate on one of the mountain’s sun terraces is an unmissable treat at this resort, so be sure to factor that into your plans. Lunch has to be at Chetzeron, a converted cable car station that serves mountain-inspired cuisine against a beautiful backdrop. As well as skiing, you can also enjoy tobogganing, boat trips across an underground lake near Saint-Léonard and an ice rink. To test your swing, there’s the 18-hole Severiano Ballesteros Golf Course and the 9-hole Jack Nicklaus. If relaxation is more what you had in mind, take some time out to explore the spa and wellness centre at LeCrans, a luxurious chalet hotel. When night falls, head into Crans for a tipple and a dance floor at Leo’s Bar or Le Pacha. And every April, after the slopes have closed, thousands descend on the resort for its annual dance festival Caprices, which lights up the town centre for three days.